There’s a documentary in the works about RVA’s Wonder Woman. Filmmaker Alexander Kreher has released a teaser trailer for his forthcoming documentary about Richmond ultra runner Zoë Romano (see below). The film, Zoë Goes Running, chronicles Romano’s 2013 run of the Tour de France, the first and only person to have run the 2,000-mile cycling course. It took five pairs of sneakers and 4,000 daily calories for Romano to complete the eight-week-long run, during which she raised $200,000 for the World Pediatric Project. Kreher is asking for donations to help complete his independent film. The Today Show recently featured Zoe Romano and her Tour de France run (see bottommost post). Zoë Romano is expected to cross the Tour de France finish line on Saturday, one day ahead of the cyclists (see bottommost post). However, because the exact course wasn’t announced until after Romano began her run, she’ll have to backtrack and run the final 300 miles in Corsica next week. On the last day, she’ll attempt 90 miles in 24 hours. Since starting in Nice, France on May 20th, Romano has averaged nearly 30 miles each day. She’s also helped raise over $132,000 for the World Pediatric Project. She hopes to raise $150,000 by the time she completes her run on August 2nd. ESPN recently published this article about Zoë Romano, who is currently running the Tour de France course (see bottommost post). Last November, thousands crowded Richmond streets to participate in the Richmond Marathon, a 26-mile race that tested everyone who took part in it. Zoë Romano will soon too run a marathon–every day for eight weeks straight when she runs the course of the Tour de France. Romano is no stranger to marathon marathons. In 2011, she ran 2,867 miles across the US over nine weeks–roughly 30 miles in six hours, each day. Romano was anxious after she graduated from UR in 2009. 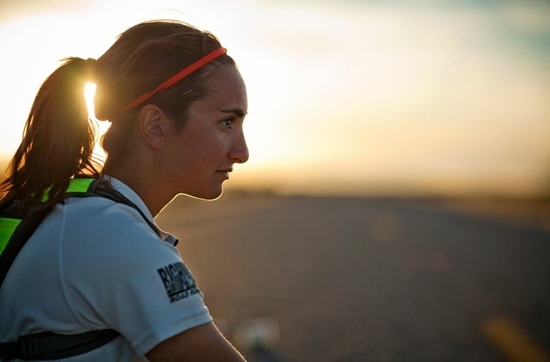 “I was having that thought of: what’s my career path going to be now that I’m graduated?” Out of school, and with time on her hands, Romano decided she would test herself by running across the US, becoming the first woman ever to do so without a support vehicle. She began in Huntington Beach, CA and ended in Charleston, SC. “The first two weeks were actually the hardest,” she said. She pushed herself too quickly in the initial days, averaging 35 daily miles. Her body hadn’t yet conditioned itself to run in step with her zeal. But it did soon enough. “What really ended up happening was that my body adapted and I got stronger.” After crossing into Texas, she again averaged 35 miles each day, this time without fatigue. In addition to breakfast and dinner, she’d stop mid-day to eat, usually fruit, tortillas, or peanut butter. She coordinated roughly 60 percent of her lodging before she left. But as the news of her journey preceded her arrival in towns across the country, residents and churches opened their doors to take her in. “It was a very unique window into small town America,” she said. Her cross-country run raised $15,000 for the Boys & Girls Club of America. Most of the money came, not from sponsors, but from individuals inspired by what she’d done. Last summer, Romano began writing a book about her cross-country experience. It made her restless. “The more that I wrote, the more I got antsy to do another adventure.” She had only one stipulation about any new run: “It’s got to be more challenging” than the last one. Romano enjoyed cycling, and her thoughts soon turned to the Tour de France, the pinnacle event of the sport. She looked at the logistics of the race and concluded that it was possible to run. Whereas her US trek was on relatively flat terrain, the Tour de France is “more intense on the elevation because of the Alps and the Pyrénées,” Romano said. “[It’s] one of the most toughest, grueling events” in cycling, let alone running. The elevation changes alone are the equivalent of three-and-a-half Mount Everest climbs. But running uphill is not her chief concern. “Going downhill is much harder on your body,” she said. Runners can overstep when on a decline, throwing their form out of whack and encouraging injury.2 She said that diminished oxygen at high altitudes will also add difficulty. Romano will begin her journey on May 18th, over a month ahead of the Tour de France cyclists. Her estimated itinerary will have her crossing the finish line on July 20th, one day ahead of cyclists. Alexander Kreher, a German-born photographer and filmmaker currently studying at VCU, will travel alongside her in a car (with her supplies) and film her journey for a documentary. Her Tour de France run will also help raise $100,000 for World Pediatric Project–$6,000 of which has already been earned before she’s taken her first steps. Visit Zoë Goes Running for more information about Zoë and her Tour de France run. She will also speak at this week’s Friday Cheers concert, and be available to meet at a tent throughout the event.